B&D Group NZ comprises of manufacturing plants in Auckland and Christchurch with a total workforce of approx. 90 people. Controlled by a local New Zealand management team, we are able to be proactive to market requirements. The other units within the B&D Group are B&D Doors (Australia) Pty and Automatic Technologies Australia Pty (ATA). Automatic Technology Australia is the leading innovator, designer and manufacturer of garage door, gate, and commercial opener products for the B&D group. B&D Doors was established in Australia in 1946 by Arthur Byrne and Paul Davidson. 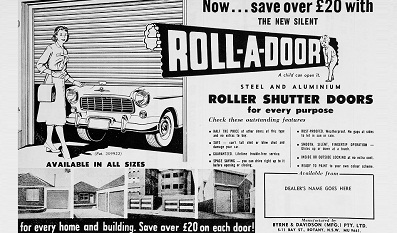 Together they invented and developed the roller door that we still manufacture today. The commencement of opener manufacturing in our purpose built Chinese facility has brought the production of all B&D Group door and opener products in-house. In New Zealand, our products are marketed through our nationwide dealer networks under the Garador and Dominator brands. B&D Group is part of DuluxGroup – visit the� DuluxGroup website to find out more. Since the unveiling of the first B&D Roll-A-Door in Sydney in 1956, the B&D brand has grown to become an Australian icon that reflects engineering ingenuity and innovation. A licencing agreement between B&D and AHI Garage Doors saw the AHI Roll-A-Door subsequently introduced to New Zealand, having a profound impact on urban streetscapes around this country. From the development of our initial revolutionary all-steel garage door made from pressed metal sheets that could be rolled and unrolled as a continuous flexible curtain without cracking, we have continued to invest heavily in research and development. Through constantly delivering design and functionality improvements, B&D has been able to maintain its Australasian market leadership position for more than 50 years. Since the unveiling of the first B&D Roll-A-Door in Sydney in 1956, the B&D brand has grown to become an Australian icon that reflects engineering ingenuity and innovation. Subsequently, a licencing agreement between B&D and AHI Garage Doors saw the AHI Roll-A-Door introduced to New Zealand having a profound impact on urban streetscapes around the country. 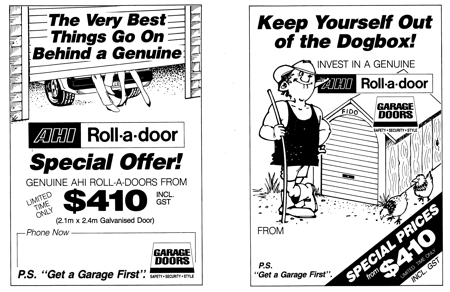 AHI Roller Door Ads from the Late 80’s Era. From the development of our initial revolutionary Roll-A-Door, all-steel garage door made from pressed metal sheets that could be rolled and unrolled as a continuous flexible curtain without cracking, we have continued to invest heavily in research and development. Through constantly delivering design and functionality improvements, B&D has been able to maintain its Australasian market leadership position for more than 50 years. For many homes a garage door provides an integral part of its street-facing appearance. That’s why B&D Doors not only manufactures doors that meet the toughest tests for performance, long life and durability, but also ones that provide the highest levels of aesthetic appeal. Custom made and fitted to the exact requirements of each opening, B&D doors are available in the elegance of molded steel in a vast array of pre-painted & Powder Coat colours. With manufacturing plants across New Zealand as well as in Australia and China, B&D is today recognised as the specialist in residential as well as industrial garage doors. Our products include the ever popular Roll-A-Door as well as New Zealand’s premium insulated sectional garage door, the B&D Therma Tech II and other innovative designs such as the new Flex-A-Door, designed to replace out-dated Tilt Doors. In addition to manufacturing excellence, B&D has continued to harness the power of cutting edge technologies to deliver greater convenience for our end users. An example of this is the incorporation of Trio-Code Multi Frequency technology into the Dominator and Garador range of openers, which eliminates the interference issues that increasingly affect openers using 433Mhz frequency operating systems. A network of more than 70 B&D Authorised Dealers across New Zealand ensures that every B&D manufactured product is backed by the highest levels of customer service and support. B&D Authorised Dealers undergo extensive training in all aspects of our products, including installation and maintenance procedures. In addition, they attend yearly conferences to update their product knowledge and review their customer service performance. As an expert in garage doors and openers, your local Dominator or Garador Dealer is able to provide comprehensive advice on the best solution for your individual requirements as well as the assurance that all service and maintenance issues will be dealt with efficiently and effectively. In 2012, we were pleased to be able to announce that we had made a long term commitment to the Canterbury region with the signing of a 10 year lease for new premises in Hornby. The past 20 months had been pretty challenging for our business and for our people, a confirmed lease was a great relief. Our premises in Bromley were first damaged in the September 2010 earthquake, but thanks to our amazing team we were able to start manufacturing again fairly quickly. However it became clear after the February 2011 quake that we couldn’t remain there long-term once part of our building was red-stickered. Since then we had been looking at our options and after an extensive search, confirmed that we would be moving our 70-strong Christchurch team across town to Hornby. We couldn’t be more thrilled about this new long term commitment to our customers, our people and the Canterbury region. Throughout the period of the Christchurch earthquakes everyone at B&D worked hard to ensure our customer needs were met with a minimum of disruption, a committed staff that saw us retaining 100% of our workforce. The new premises are a significant step forward, and will help us as we gear up for the Christchurch rebuild. As you can imagine, competition for these sites – when they become available – was pretty strong, with the signing of the lease, we were now able turn our attention to the move. We had a detailed process to work through as we relocated. Planning progressed well and we devoted additional manpower to project-manage the shift. As a manufacturer we wanted this relocation to happen with minimal impact on our people, on supply, on our dealers and our customers.